Your construction or restoration company deserves the very best restoration equipment. After all, the success (and bottom line) of your business ultimately depends on it. Not having reliable equipment can hinder your ability to make a profit. Faulty heaters, for example, can cause the completion of your job to be delayed or even halted entirely. In the winter months especially, it’s crucial to have reliable restoration heaters for your indoor and outdoor jobs. As you know, heaters help you not only warm your workspace, but can help speed up the drying process for things like floors, basements, and more. This especially comes in handy during winter construction projects, when snow or other precipitation can sneak in before the roof, doors, or windows are installed. Which brings us to the eternal debate. 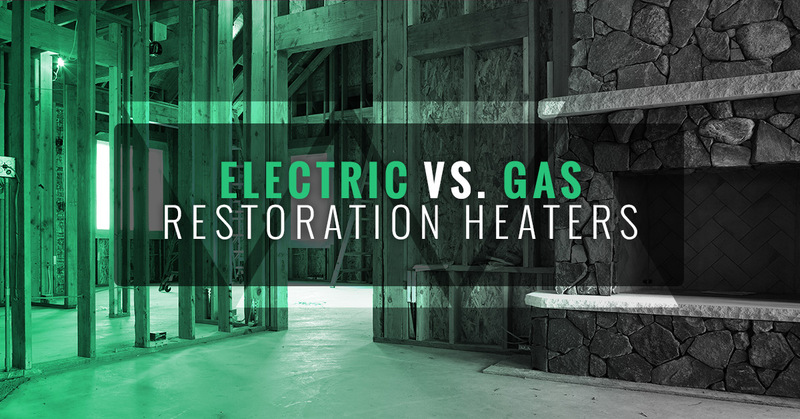 Which type of restoration equipment is better: an electric heater, or a gas (propane) heater? In this post, we’ll lay out a few of the pros and cons for each type of heater to help you make the best business decision for your company. After all, at Colorado Tri-Flo Systems, it’s our goal to help everyone thrive. Let’s take a look, shall we? For whatever reason, it seems like gas heaters are more ubiquitous when it comes to the construction and restoration industry. It could be that they seem more cost efficient, more convenient, or just more readily available. However, it’s important that you take the time to do thorough research before just buying the first, cheapest heating solution that you come across. Gas heaters actually require a bit more maintenance than electric heaters. But that’s not all. Here are some of the main drawbacks of installing a gas heater for your business’ work site. Typically, gas heaters aren’t portable solutions. Instead, they have to be installed, often by a certified professional, which costs you even more time and money. Along with the installation of the heater itself, you have to deal with proper ventilation to avoid health and safety risks from the combustion and emission process. Generally speaking, gas heaters don’t last as long as their electric counterparts. This could be due to a variety of factors, including: neglecting routine maintenance, improper or infrequent cleaning of the vents, and not replacing the filters on a regular basis. Perhaps the biggest pitfall when it comes to gas heaters or furnaces, however, is the safety factor. While it’s not a regular occurrence, gas heaters are still susceptible to gas leaks, combustions, and worse. That can pose a major health and safety risk for you, your crew, and others. Carbon monoxide is silent and deadly, and these types of poisonous leaks are always a risk when propane or other gas is involved. On the flip side, when it comes to high quality restoration equipment, it’s hard to go wrong with an electric heater. Why is that? Well for one, they are typically more cost efficient than their gas counterparts. But there are numerous other reasons why your company should consider electric construction heaters. Here are but a few. This is the big one. Electric construction heaters are easy to operate and maintain, sure. But they are also much safer than the combustible gas heaters. There is little-to-no risk of combustion, and zero carbon monoxide risk with an electric construction or restoration heater. That means peace of mind for you and your business, no matter the elements or working conditions. Secondly, electric heaters are much more reliable and convenient. Rather than needing a professional to perform a full-scale (and expensive) installation, all you need to do is simply plug in your electric heater to the outlets on site. Plus, you can take your portable electric heater from job to job, without having to worry about a new installation or ventilation concerns. Because of their simple, efficient nature, electric construction heaters are much more low-maintenance than gas types. You or someone on your team would likely be able to handle maintenance yourself, even in the event of a minor malfunction. This allows your electric heaters to last between 20 and 30 years if treated properly. Colorado Tri-Flo Systems is the leading manufacturer and distributor of highly efficient and reliable electric construction heaters. Perfect for a variety of industry uses, including drying, heating, and more, our heating solutions are built for companies like yours. Learn more about our portable electric construction heaters and place your order today.